Police would like to speak to the man pictured in connection with the machete attack. A member of staff at a Northampton town centre nightclub was stabbed with a machete. 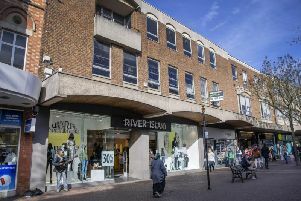 The incident took place on Saturday, October 28 between 1.15am and 1.30am when a man was refused entry to the Fever and Boutique nightclub, the Drapery, by door staff. The man began to make threats before pulling out a machete and stabbing a member of staff in the shoulder, causing injury. Police want to speak to the man pictured as they believe he may have information about the assault. The man, or anyone who recognises him, is asked to contact Northamptonshire Police on 101 or Crimestoppers anonymously on 0800 555 111.